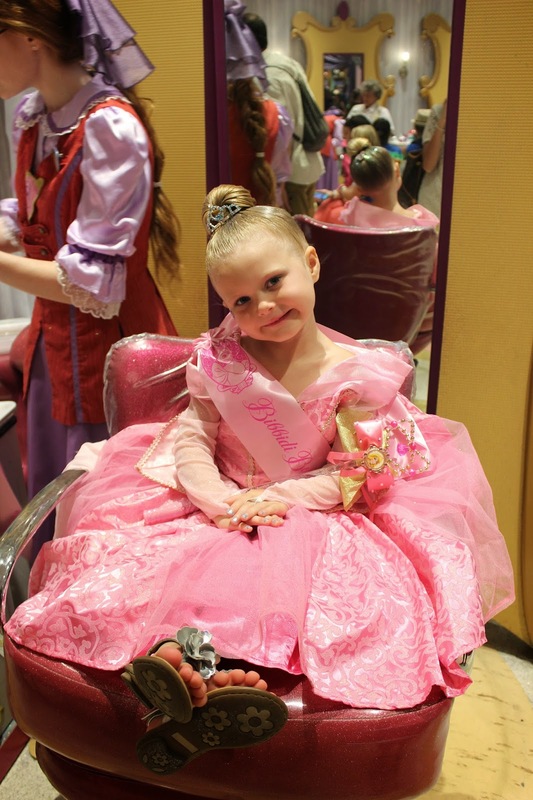 Part of Carolyne-Grace's 4th birthday trip to Disney included a night of pampering at the Bibbidi Bobbidi Boutique! 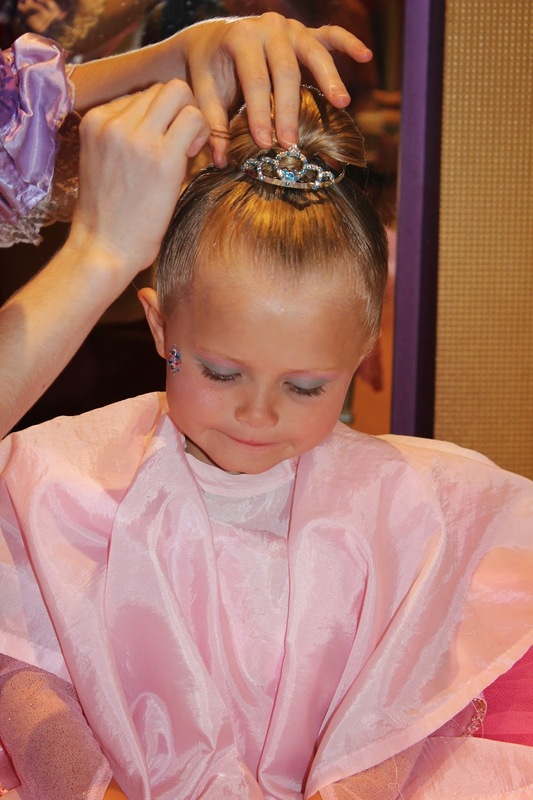 The BBB is a magical salon set up for little girls 3-12 to be transformed into their favorite Disney princess. This was a much anticipated event so CG had been thinking for weeks about which princess she wanted to be. Before we went she picked Sleeping Beauty! 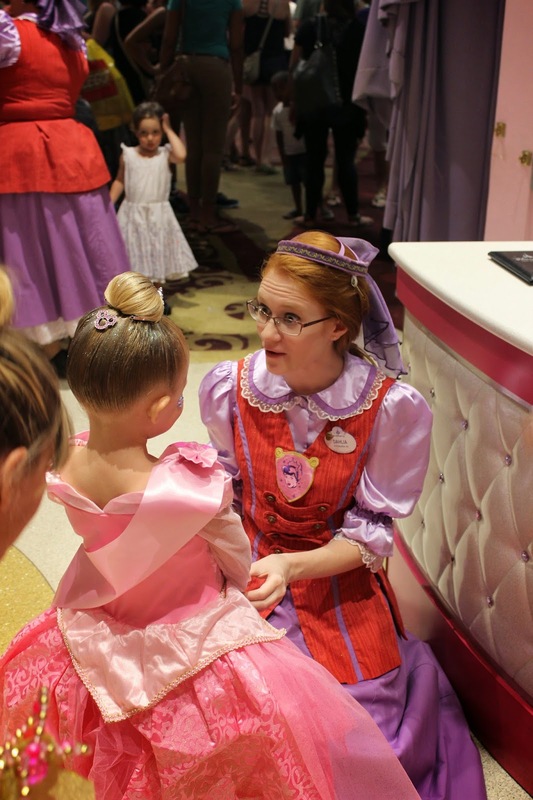 : ) When we got to BBB they greeted "Princess Gracie" and asked her to make her princess selection. For some reason she veered from her original choice and picked Repunzel. We had about a 45 minute wait time before we were called back so my mom and I decided to change her back to Sleeping Beauty since it was a lot cuter. Your princess will be able to choose from several hair styles and make up colors. This girl took her role as princess VERY seriously and did not break character all night! She LOVED the attention from strangers and kept saying, "they really think I'm a real princess!" *Don't wait to make reservations. You can book a time up to 180 days in advance..I waited until the week before our trip and was only able to get a 7:00 reservation the first night we were there. It actually worked out great but wasn't our first choice. 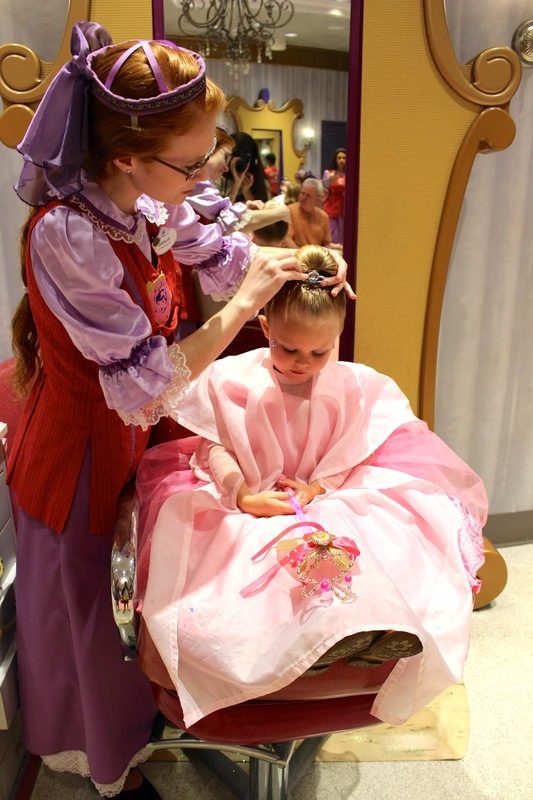 *If your princess won't want to wear her dress all day at Magic Kingdom book your appointment in Downtown Disney. Again, this was not our first choice but we are actually really glad we chose the DD option. We were able to walk around, go out to eat, etc. all while Princess Gracie was loving the attention of strangers and not dealing with an itchy costume in the park all day. *If your princess thinks dress up clothes are itchy bring an under shirt. CG had a slight melt down in the dressing room because her dress was "SOOOOO ITCHY!" We put her cotton dress on underneath with the straps tucked in and it solved the problem. *If you want your princess to actually LOOK like a princess help them choose their hair and makeup. There are a lot of choices and CG kept choosing the most obnoxious ones (colored feathers coming out of a ponytail..? no thanks!) We picked her hair style and let her choose her makeup. Her hair stayed in place this way for THREE days. She was able to wear it the next day to Magic Kingdom (along with her sash and wand) and still received just as much attention from the princesses. *There are several packages to choose from but I would recommend going with the top, The Castle Package. The experience alone is worth every penny. & in case you're wondering, they also have pirate and knight options for boys. Although Adam says Bennett will never participate ; ) HA! This is precious! I can't wait until Harper is big enough to do this! This is so fun! 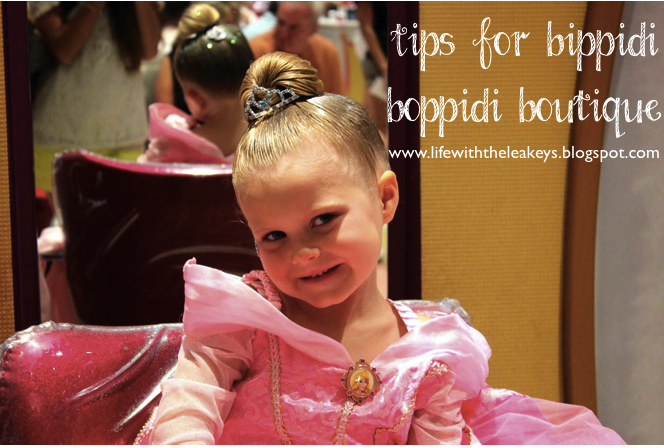 We went to Disney a few weeks ago and it was so fun to see all of the little girls after their BBB experiences. We definitely complimented each of them and they loved it! So glad she was able to experience this for her birthday! If I ever go to Disney I'll be sure to take a niece with me so we can to do this too. My childhood dream come true!